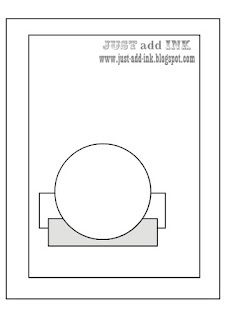 Just Add Ink #281....3 Fave Colours! Most people that know me are well aware of my love of orange, actually it's a love of many versions of that from bright pumpkin through to soft peach....So it goes without saying that it would be a feature on my project. The other faves l have included are Mint Macaron for the leaves and Blushing Bride is the first ink layer on the Dahlia, the second being Calypso Coral as my nod to orange tones. Afternoon all!...I've been having a little stamping fun with the lovely "Wonderland" set. This was the first thing on my wish list from the Holiday Catalogue and I'm so glad l invested. I love the slender look of the pines and the super cute antlers as well. This one is stamped in Lost Lagoon, it's a perfect colour for soft fresh Christmas card. Lordy that week flew! 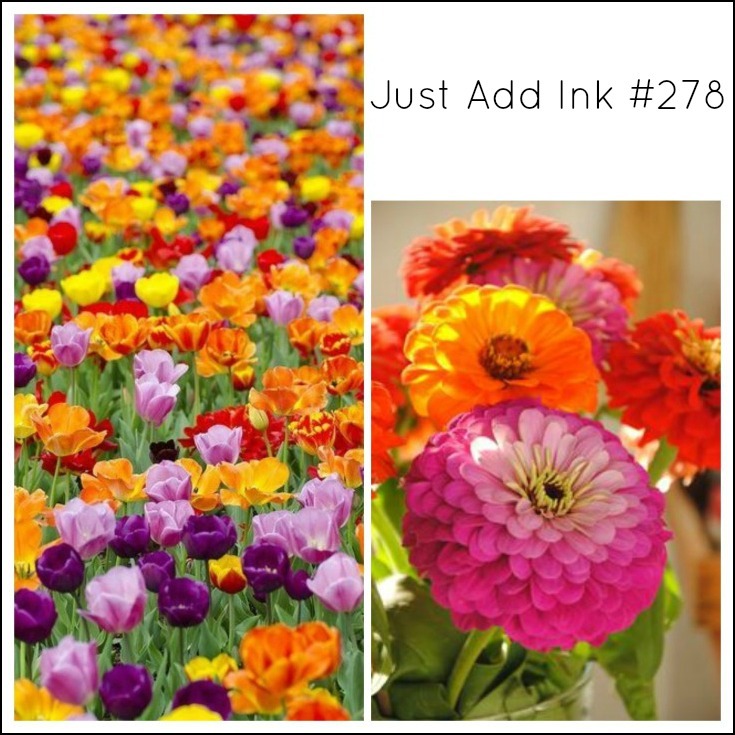 I can't believe it's time to share our new Just Add Ink challenge already. This week it's all about the "SPARKLE" well "GLIMMER" to be more precise..:0) Our challenge this week is to "Just Add Glimmer" to your project....So easy and so many options. I had just received my "Happy Patterns" masks from SU and had so many fun ideas l wanted to try, this was one of them. I chose the mask l wanted to use and using a sponge and some good old PVA glue, l gently applied it to the card base, it literally took no time to dry as it's a really thin application. Don't forget to wash your mask ASAP as it will dry on there quickly too! So l had my base, now for some "GLIMMER"...after trying a few different options, l finally settled for some elegant glimmer butterflies. 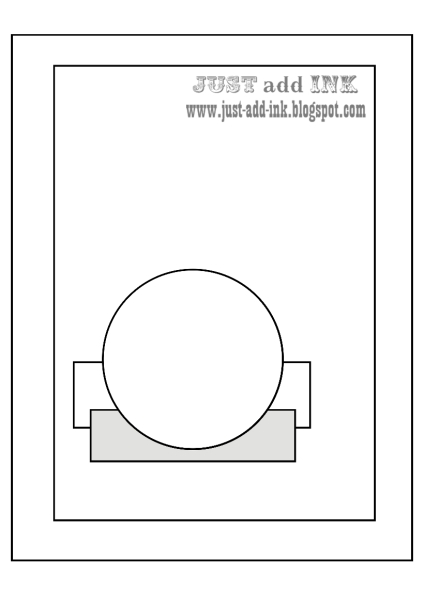 I then created a matching box using This fab youtube tutorial from Papercraft Button. Don't forget to pop over to the challenge blog and be "Glimmer" inspired! As promised in my earlier post, this is another of my Christmas card creations that l've been making for the last few weeks. This one is done in Mossy Meadow, the lovely "Season of Cheer" dsp and that dainty little poinsettia was created with the new "Festive Flower Builder" punch....Love that it works a treat for leaves too! This beautiful weather means summer is on it's way and that also means Christmas is hot on it's heals. So with that on my mind l thought l would share some of the cards l've been making over the past few weeks using the new SU goodies. 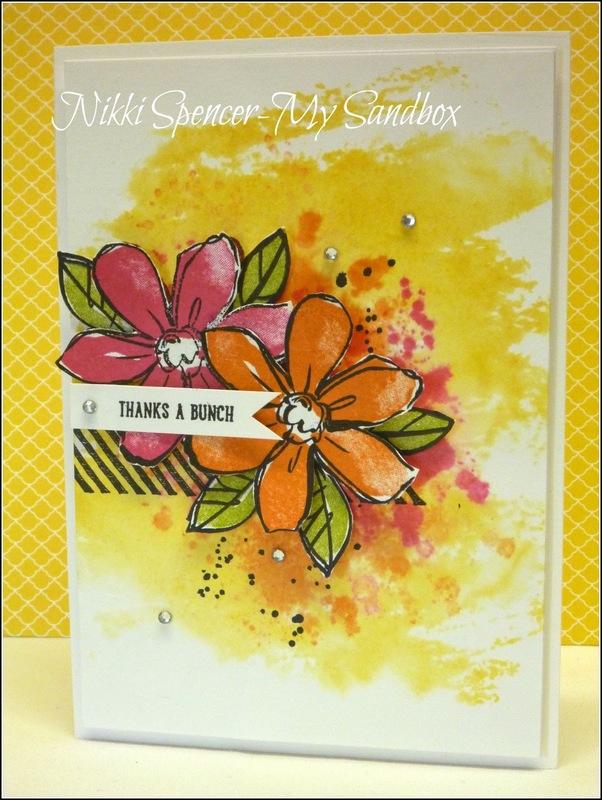 This one uses the lovely multi stamping "Joyful Season" set. I love that you can simply overlay the images and get a lovely watercolour effect. Well' l'll be back with more Christmas inspiration shortly! 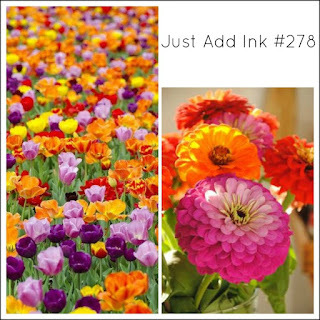 Hey there!...It's that time of the week again for sharing our new Just Add Ink challenge. Narelle has given us a great sketch that l really enjoyed using. With all of the new Christmas goodies available from Stampin Up l just had to go there..:0) I kept it cas, as l generally don't go for mega layers on my Christmas cards, preferring to keep them simple but still interesting and easy to mass produce. This one uses the lovely "Reason for the Season" stamp set which also has the cute coordinating "Festive Flower Builder"punch...It makes great poinsettias in no time and works really well as a leaf punch too! Don't forget to check out the fab creations from the rest of the design team! As you can tell from both this and my previous post, I'm having loads of fun with the "Happy Patterns Masks". This one uses Night of Navy, Island Indigo & Pool Party applied with a sponge to create an ombre effect, so quick and easy to create fabulous & fun backgrounds. Happy Patterns Mask.... Thank You! 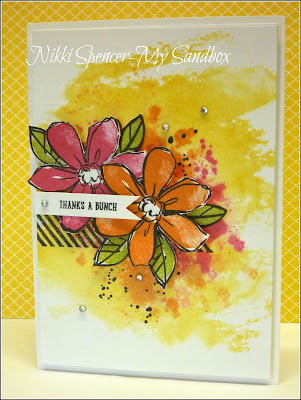 This week over at Just Add Ink we have a lovely spring inspired challenge, l love the colourful display of blooms and thoroughly enjoyed creating this weeks design team project! I used the Watercolour Wash background stamp and inked it up with some Daffodil Delight and spritzed with water before stamping. I also used the same technique on the large grunge image from Gorgeous Grunge in Pumpkin Pie & Melon Mambo and used the same colours with Garden in Bloom image. The design team have created some fabulous projects with the inspiration, so don't forget to pop over and check them out!